U.S. House Set to Pass Doomed Spending-Cut Bill With No Debt Deal Imminent – Bloomberg. Two weeks from a threatened default, U.S. House Republicans today plan to defy President Barack Obama’s promised veto by voting to slash spending and condition a $2.4 trillion debt-ceiling increase on passage of a constitutional amendment to balance the budget. “Slashing” spending is and will always be a hyperbolic pronouncement with little chance of follow through. It’s as if the United States is going on a crash diet in which it subsists on a daily concoction of lemon juice, maple syrup, cayenne pepper, and water. Within a week, Canada and Mexico will find us unbearable. No one wants to face the reality of our economic situation. It’s not like we can just cancel our cable (“We don’t even watch half these channels!”) and call it a day. And we’re certainly not going to end our $1,000 a day cocaine habit (replace “cocaine” with “military spending”). Are there any real businesses that survived the recession with such crack-pipe proposals? There were lay-offs, hiring and wage freezes, and occasionally increased prices for their products. In other words, difficult decisions were made. Meanwhile, the United States wants to cease wasting money on paper clips and plastic spoons in the company cafeteria. That will stop the bleeding. A constitutional amendment to balance the budget is what is called a “magic pill.” It’s tantamount to the CEO of Borders passing an edict banning Kindles. No one can answer how the law will change the conditions that make it impossible for us to achieve this now. And no one wants to answer the question as to how we balanced the budget the last time. The Clinton years showed the effects of a large tax increase that Clinton pushed through in his first year… It fell almost exclusively on upper-income taxpayers. Clinton’s fiscal 1994 budget also contained some spending restraints. An equally if not more powerful influence was the booming economy and huge gains in the stock markets, the so-called dot-com bubble, which brought in hundreds of millions in unanticipated tax revenue from taxes on capital gains and rising salaries. It’s most likely impossible to reproduce the conditions of the Clinton era. Most U.S. citizens are unwilling to wear all that flannel again or go to another Spice Girls concert. However, the political game being played of wanting to make a cheeseburger without using actual cheese or hamburger meat is going to inevitably reduce our economy into the drive-through at McDonald’s. The Senate’s top Republican said Tuesday that he did not see a way for Republicans and Democrats to come to agreement on meaningful deficit reduction as long as President Obama remains in office. “After years of discussions and months of negotiations, I have little question that as long as this president is in the Oval Office, a real solution is probably unattainable,” Senate Republican Leader Mitch McConnell said in remarks on the Senate floor. OK, Obama is the problem. He’s what’s preventing us from going bankrupt by not concentrating more of the country’s wealth in a small percentage of Americans for whom we cannot consider raising taxes. Treasury Secretary Timothy Geithner and many economists have warned of economic catastrophe if the $14.3 trillion debt ceiling is not raised before August 2. So, I suppose the responsible action McConnell is promoting is to impeach Obama. What choice do we have given what’s at stake? The GOP did detect weakness when Biden interrupted Obama to ask Speaker Boehner if the “Tattaglias guarantee our investment.” I think they’re confident that once Obama is out of the way, Biden will cooperate. 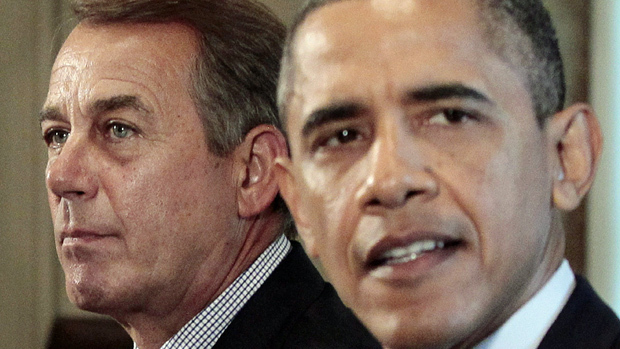 After strenuous debate, House Speaker Boehner and President Obama agree that DC stands for "District of Columbia." According to a source in the room, Boehner said he initially sought a larger deal that included reform to entitlement programs. Mr. Obama agreed, he said — on the condition that the deal include revenue increases. Whenever I read about “reform” to entitlement programs, I think about how convicts are “reformed” by their cellmates in prison. In Boehner’s telling, he refused to consider tax increases but said he would discuss tax reform — lowering tax rates while closing tax loopholes in a way that was revenue neutral. Mr. Obama countered that he would consider corporate tax reform but not personal tax reform. Boehner, the source said, told his caucus he wanted both, arguing that such an approach is necessary because some small business owners claim earnings as personal income. Mr. Obama agreed, on the condition that the Bush-era tax cuts for low earners be made permanent — presumably while the tax cuts for high earners are allowed to expire. In Boehner’s telling, that’s when talks began to break down. Boehner might not fully grasp what “negotiation” means. I am impressed that he is able to hold the line on refusing tax increases for the smallest and wealthiest percent of the country. People are heading over to Casey Anthony’s house with pitchforks and torches but the entire economic system as they know it is held hostage over a fraction of the population who would most likely find ways to beat any tax increase anyway.